Every year I promise myself a red, white and blue quilt for the summer. I’ve never made it happen – until now. 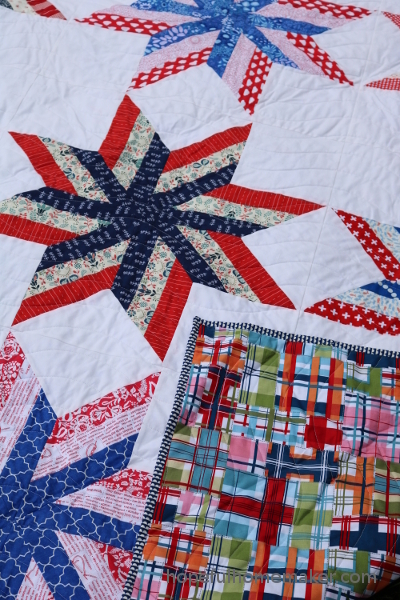 I’d like to introduce my Anthem quilt, a vintage-inspired star quilt that is a quick and fun project. This quilt is inspired by a vintage block I came across a while ago. I was drawn to the way the stripes rotate around the star, reminding me of festive pinwheels spinning at bike parades on holidays. Given my love of the lone star block, I liked this variation and decided to try it out. I chose to play with color just a bit, using both navy blues and royal blues, as well as different reds, to create a slight secondary pattern with the nine blocks. These blocks come together very quickly (strip piecing and no Y seams) and provide big impact. I designed the blocks to be large and they finish at 22″. Nine blocks will make a quilt that measures 66″ square. 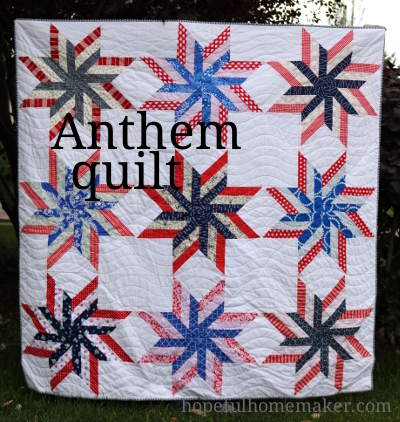 The Anthem quilt pattern is for sale in my Etsy store. Download the pattern now and have a finished quilt top before you know it! I love history, particularly American Revolutionary history. These colors are precious to me; I have loved them as long as I can remember. They stir my heart and I yearn to be better. I made this quilt to capture those feelings. 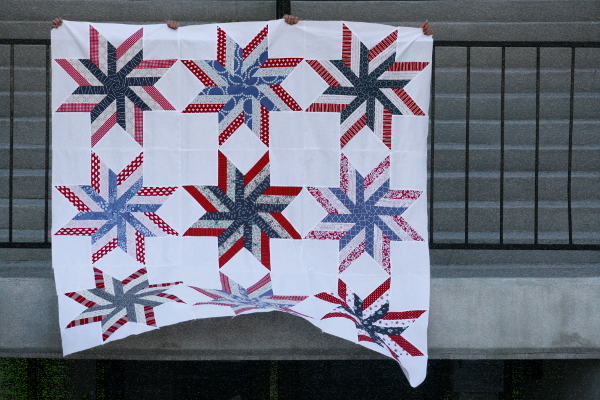 I chose simple wavy lines for the quilting to give the impression of stars waving in the air like a banner. For the backing I selected a multi-colored plaid I’ve been saving for years. A navy scallop print frames the quilt as binding. 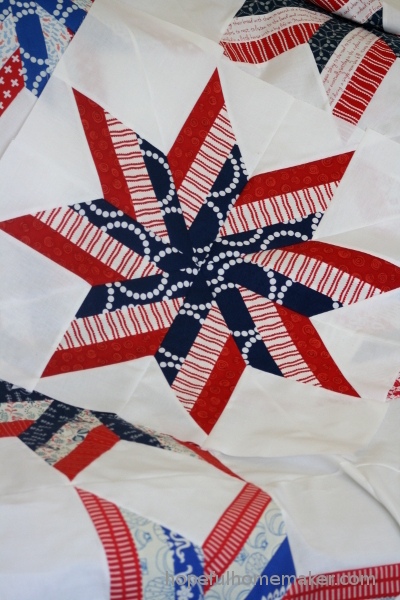 And I end where I began… I finally made myself a red, white and blue quilt! What will you make with this pattern? Purchase a copy today. Happy Sewing! Wow…inspires me to do red,white & blue. So on your star quilts, you join 4 points and then put the squares and triangles in then join the 4 points to make a 8 point star? I don’t do mine by all the little cuttings, I individually cut my diamonds and then join them, 4 at a time and then join all 8 and then put squares and triangles. But what I’m getting at is sometimes after they’re joined they don’t want to lay flat. 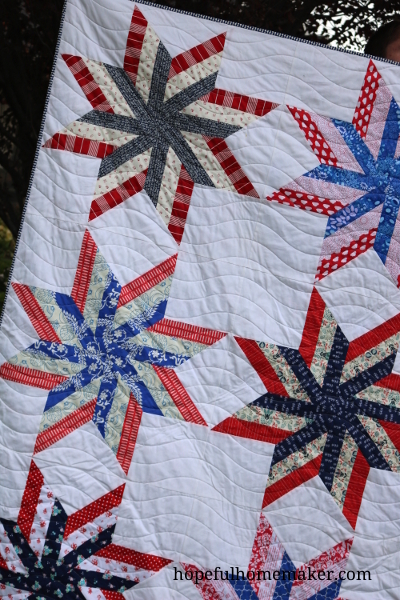 One of the biggest challenges to making these stars, no matter how you do it, is handling the bias so your pieces don’t stretch or warp, and so your block will lay flat. Have you tried using a starch or starch alternative to help with it?